- Smooth and soft hand feeling for you, easy to clean. - Fine stitching technology and vintage metal zippers keeps the bag elegant and practical. - The rivets on the bottom prevents the bag from slipping and wearing. - Matched with a shoulder strap, which can be adjusted and removed if you need. - Please allow a little error on size due to the manual measurement. - A little smell may exist when you receive the package at the first time, we suggest putting it on the ventilated place for a while, and the smell will disappear. 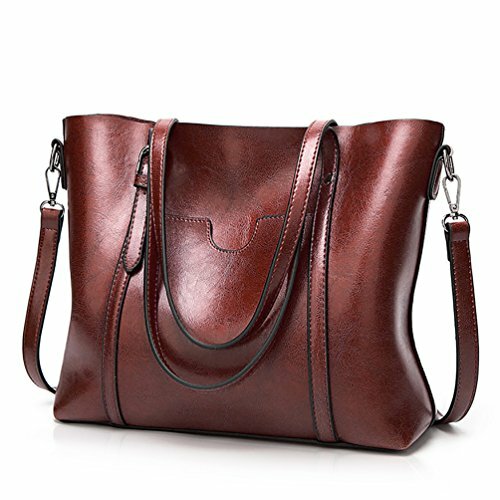 Size: 32*12*30cm/12.6*4.7*12"(L*W*H); Height of Handle: 9.4 inch. Various ways to carry: A shoulder bag, a crossbody bag and a handbag; The shoulder strap can be adjusted and removed. Many pockets design makes your things organized like phone, umbrella, books, and cosmetics, makes you easy access to your daily necessary stuffs. If you have any questions about this product by EssFeeni, contact us by completing and submitting the form below. If you are looking for a specif part number, please include it with your message.